Today I have an interview with Karen Healey, the author the YA science fiction novel When We Wake. She was kind enough to answer a few questions for me! 1. Congratulations on the release of When We Wake! Could you tell us a little bit about the book in your own words? It’s a Sleeping Beauty story set in the future, where a girl who died on the happiest day of her life wakes up a hundred years later. She’s the first successful cryonic revival, and she’s the instant target of a lot of positive and negative attention. All she wants to do is grieve and recreate a life for herself, but a lot of people want to use her for one reason or another. 2. How did you go about creating the Australia, and Melbourne, of the future for your book? What kinds of research did you have to do? Living in Melbourne for five years was good research! It’s such a multi-cultural place, something I tried really hard to get across – that excellent blend of style, culture and voice. I wanted to get across the way the lanes and broad roads feel, that combination of wide spaces and squished, secretive alleys. I did a lot of research on the likely effects of climate change on Melbourne and Australia, none of it particularly cheerful. And, as always, since I know nothing about trees, I spent some time on horticulture sites. Trees are hard! 3. I love Tegan’s voice – she’s a great story-teller, and her situation is easy to relate to. What inspired her character? I wanted to write someone who was stubborn to the bone, someone who would never give up to make things easier on herself, who would rather jump off a roof than stop running because someone with a gun told her to freeze. She’s reckless, and passionate, and her voice came very easily to me. 4. Tell us a little about writing Abdi’s character. Do you think a future where he is treated so unfairly is likely to come about? Let’s see, do I think an Australia where someone is verbally bullied for being a foreign student is likely? Sure, it’s happening right now. Do I think an Australia with a flat No Migrant Policy is likely? I really hope not! Abdi was interesting to write – I’ve just finished the sequel, which is written from his point of view. He’s mysterious to Tegan, and the reader, at first, but I’ve always had a fairly pretty clear idea of his motivations and talents. He’s very angry about a lot of things, but he tends to suppress that anger so he can achieve his goals – unlike Tegan! When Tegan gets angry, everyone knows it. 5. 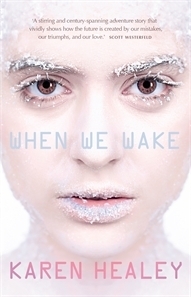 The cover for When We Wake is amazing! Did you have a lot of input into it? Almost none! My publishers sent it to me when it was nearly done, and I shrieked with joy, and then made a few comments about the font. Really, my publishers on both sides of the Pacific did such a terrific job with it, there wasn’t anything for me to say. This is the first cover where a photoshoot took place especially for one of my books, and I think it worked out great! 1. Which is your favourite Australian city? 2. Name a technology you hope humans have in the next century. Faster than light travel! … failing that, a process to quickly restore topsoil life would be awfully handy. 3. Would you want to be cryogenically frozen and wake up in a different century? Definitely not. I’d miss out on the lives of everyone I love! Karen Healey is a young adult novelist. She is the author of the urban fantasies Guardian of the Dead and The Shattering, both set in New Zealand, and the sci-fi adventure When We Wake. Guardian of the Dead won the 2010 Aurealis Award for Best YA Novel and was a finalist for the William C. Morris Award. Karen can tell you a lot about baking, covers of “Hallelujah” and superhero comics. When We Wake is published in Australia by Allen and Unwin, and is available now at all good bookstores and online. I have reviewed When We Wake here as part of the 2013 Australian Women Writers Reading Challenge. I thank Karen for taking the time out to answer these questions for me, it’s been a real pleasure to have her on Speculating on SpecFic!